Each year, the Center for Latin American Studies (CLAS) awards 15 to 20 graduate students a travel grant, which they can use to fund an independent study or unpaid internship in their country of interest during the summer. 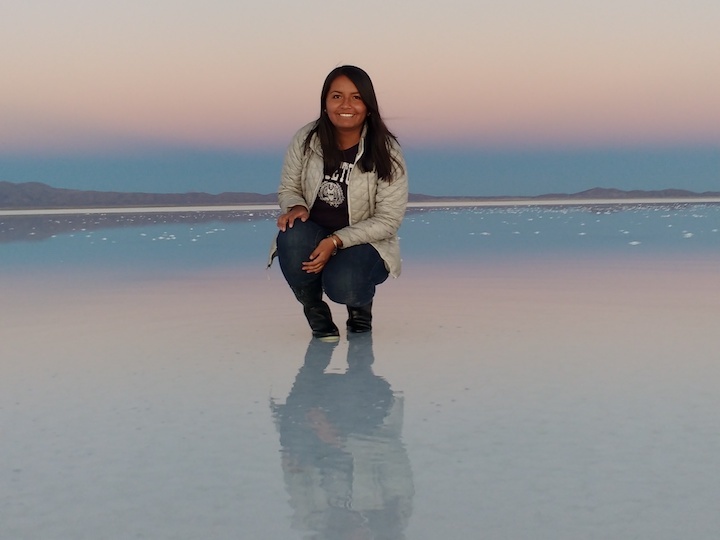 Claudia Soliz Castro at the Salar de Uyuni in Bolivia. The grants, which are funded by the School of Foreign Service Dean’s Office, have sponsored student trips to virtually every country in Latin America. Recent projects have focused on a variety of topics, including social welfare in Brazil, baseball and bilingualism in the Dominican Republic, and international trade in Ecuador. The grant can also be used to cover travel expenses for CLAS students participating in any of the three summer programs offered for graduate and select undergraduate students. The programs—in Brazil, Chile, and Colombia—each involve a full-time internship, as well as an intensive, month-long graduate level course. 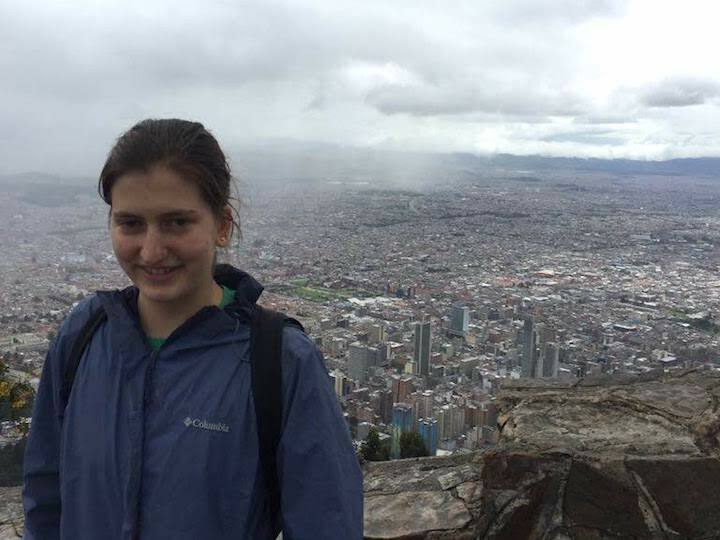 Amanda Chatupron-Lacayo (G’19) used her travel grant to secure an internship at the Office of the United Nations High Commissioner for Human Rights in Bogotá, Colombia. By working with the Office’s Public Information Unit, Chatupron-Lacayo was able to enrich her knowledge of human rights issues and regional security. “Without a firsthand experience of the unique issues Colombia faces with respect to these two themes, it would have been very difficult to engage with a topic that requires in-depth knowledge of the situation in Colombia today,” said Chatupron-Lacayo. Amanda Chatupron-Lacayo at her internship with the Office of the United Nations High Commissioner for Human Rights. The travel grant experience helped shape Chatupron-Lacayo’s capstone project and deepened her interest in Latin America, but she says her most memorable experience was witnessing activists advocate for the protection of human rights defenders. Receiving a grant allowed Claudia Soliz Castro (G’19), a graduate student pursuing a master’s in Latin American studies, to conduct three months of fieldwork in Peru, Chile, and Bolivia, her native country. The fieldwork gave Soliz Castro access to formal and informal sources that were only available in-country, allowing her to further develop her thesis. Soliz Castro found that it is especially valuable to get information from different voices because informal market research is prone to author bias. “Being able to find research by Bolivian authors and written for Spanish-speaking readers was very helpful, because I was able to get a new perspective on what I was studying,” Soliz Castro said. Recently, CLAS added a travel blog component to their grant program, where students can post about their experiences abroad. Posts vary in their topics and approaches, reflecting the wide array of interests within the center. Some explore inequality, conflict, or culture through a linguistic or economic lens, while others are more personal, detailing museum visits and giving advice to future CLAS travel grant recipients. The Berkley Center for Religion, Peace, and World Affairs and the Pulitzer Center on Crisis Reporting sponsor a student's international reporting project each summer.